Use OneTouch Ultra Strips with with OneTouch Ultra and OneTouch UltraSmart Brand Meters and InDuo Systems. 100 Test Strips - 4 Vials of 25 Test Strips. - Require only a tiny sample. 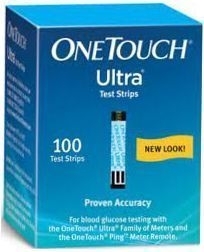 I have used other meters and test strips, but when I started using OneTouch Ultra test strips and the OneTouch UltraSmart meter, I never went back to any other brand. The quick, easy use of both meters and test strips makes it faster and easier to get the job done. Also, it takes so little blood. A real winner as far as I'm concerned!